Lisa Lapinski | Fine Evening, Sir! In her first solo exhibition at GALERIE KÖNIG, the Los Angeles artist Lisa Lapinski (born in 1967) presents a sculpture as well as new drawings, collages, and prints. The central work of the exhibition Nightstand (2005) was originally developed for the gallery's former space on Weydinger Straße, but first shown at the 2006 Whitney Biennial in New York. It will now be shown for the first time in Germany GALERIE KÖNIG`s new space. Nightstand reflects the artist’s interest in different forms of representation and visual production in the spiritual and everyday lives of the Shakers, a religious community founded in mid-century New York. Drawers, frames, and wardrobe doors of wood are placed across and on top of one another, rising up like a pyramid. They are topped by a painting depicting a witch, done largely in primary colors. The sculpture is the artist’s personal translation of Shaker gift drawings. The drawings from a twenty year period of Shaker revivalism were meant to be depictions of states of religious ecstasy. Some individual parts of the installation are based on the style and technique of Shaker furniture, which due to its high standard of craftsmanship, formal rigor, simplicity, and functionality became an important model for modernist design. 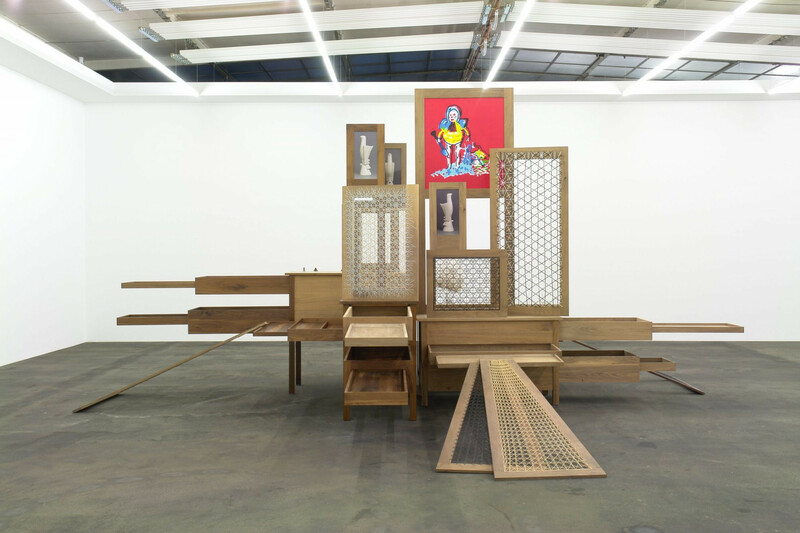 Lapinski thus deconstructs the traditional furniture, reassembling the individual components into a kind of altar. Elements such as mystical seeming photographs of Gustav Miklos bird sculptures, Stars of David, and decorative props underscore this impression of a place of worship. Lapinski also treats this issue in her series of collages, drawings and assemblages, titled Fine Evening, Sir! (2006). The work consists primarily of decorative elements that are found in the applied arts, such as various designs for Chippendale Chinese railings; however, the artist’s compositional decisions rely more heavily on the methods of structuring scientific diagrams. The beginning of this work was a chance encounter with a stranger in Los Angeles. The man told Lapinski about a job interview which he had had in the sixties for which he to take a series of psychological tests, one being the Rorschach test. The man said that the psychologist claimed he would not be capable of working with others because he had seen the abstract shapes in the Rorschach as a paramecium. If he had seen a paisley, it would have meant that he could work well with others and he would have been recommended for the position. Lapinski was struck by the fact that the test assumed a person’s predisposition for successful socialization turned on whether he saw the diagrammatic/scientific or the decorative in abstraction. In Spring 2007 Lisa Lapinski will be showing an individual exhibition at the Midway Center for Contemporary Art in Minneapolis: for this occasion a comprehensive catalogue of her work will be published.